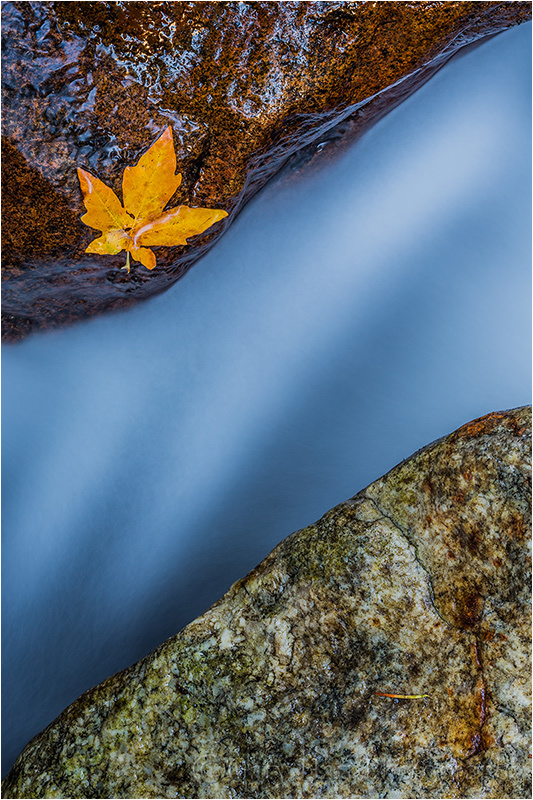 In my November 4 post, I wrote at length about a recent morning spent photographing a single leaf I found plastered to a rock beside Bridalveil Creek in Yosemite (and my feelings about staged scenes). 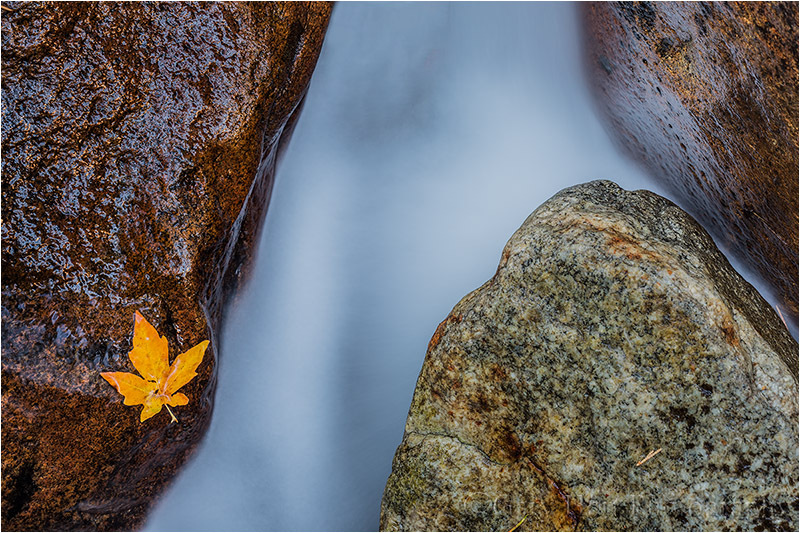 While my entire shoot that morning was all about one found leaf, it was just the latest in a long succession of focused visits to Bridalveil Creek. Each time I visit here the creek is different: In spring Bridalveil Creek spills into three distinct branches, each bulging with rushing snowmelt; most autumns, the creek has shrunk one branch, a trickle of its former self, decorated with yellow leaves; in winter the banks are lined with snow and ice crusts the surface. On each visit I usually choose a scene and work it to within an inch of its life. On this most recent morning I spent an hour photographing this one leaf, making sure I left no shot un-shot: Multiple lenses, a range of focal lengths, horizontal and vertical orientation, and a variety of perspectives. Here’s the same image rotated into a vertical. Whenever possible, I like to horizontal and vertical version of each scene I photography, but rarely do they come out identical because each orientation requires its own crop. But an advantage of photographing a scene from directly above is that there’s no top or bottom to the scene. To make the horizontal scene into a vertical, I could have rotated my camera 90 degrees and re-shot, but it was much easier to simply rotate the image in Photoshop. Shortly after I started working on the scene, a breeze kicked up and deposited a green leaf right on top of the pine needle mentioned above. Not only was it a not particularly photogenic leaf, it was upside-down (clearly I need to work on my powers of telepathic manifestation). But rather than knock the rogue leaf into the creek, I included it in my composition, capturing several frames before the breeze returned and did the dirty work for me. While it would be silly to pretend that digital photography hasn’t changed my photographic life, at heart I’m simply a film shooter with a digital camera. If you read my writings or have attended my workshops, you’ve no doubt heard me say that photography, at any level, must be a source of pleasure. How each of us derives our pleasure varies greatly, from what we shoot, to how we shoot, to what we do with (to) our images after we shoot them. From what I’ve observed, many photographers relish their time at the computer, scrutinizing corner sharpness, high ISO shadow noise, and working Photoshop magic to take their images to the next level. I’ve always been so much happier outside, simply enjoying, and making pictures of, the things I love—the computer, while necessary, always feels too much like work. That’s probably because I came to photography as a career after twenty-plus years in the high-tech industry. During those twenty years my time with my camera was pure pleasure, a creative escape from the technical geek-speak of my everyday life—what would be the point of leaving a good job with a great company (Intel) only to turn my joy into just another job? So when I decided to take the full-time photography plunge, it was with the very conscious personal commitment that I’d only photograph what I want to photograph, the way I want to photograph it. For me that means the natural light, color landscapes that I’d been photographing since the first shutter click of my Olympus OM-2, over thirty years ago: no people, no wildlife—basically, nothing that moves. Ensuring my photographic pleasure also means doing things the way I’ve always done them: in addition to all natural light (I’m probably the only pro photographer alive who doesn’t own a flash), I choose to do no multi-image (HDR, manual blending, stitching) captures. I also rarely deviate from the 35mm 2/3 aspect ratio I was weaned on. But that’s just me. And just because I don’t do it, doesn’t mean I don’t marvel at other photographers’ monochrome, HDR, and artificial light wizardry. I’ve also grown to become a huge fan of Photoshop, and the control it gives me: After all those years envying black and white shooters for their darkroom magic, it’s nice to see the playing field leveled a bit for us color shooters. In fact, many of my most successful images wouldn’t have been possible with the color transparencies I shot in my OM-2 days. But ultimately, despite Photoshop’s power, I still want my creativity to be in my camera, not my computer. On the other hand, I have no problem with photographers who use Photoshop creatively (as long as they do it honestly). What I do have a problem with is the people who have so thoroughly embraced photography’s technical side that not only have they lost their joy, they seem bent on sapping the joy from anyone with a different idea or approach. These are the blog posters and forum contributors who will go to the mat for Canon vs. Nikon, Nik Dfine vs. Noise Ninja, or whatever their technical pulpit might be (I once witnessed a heated online debate about how to sign a print). So here’s a tip: If you find yourself arguing with somebody about some piece of photographic minutia, step away from the computer (these things rarely happen face-to-face), grab your camera, and go take some pictures. In other words, turn off your inner geek and connect with your creative side—the world (yours and mine) will be a better place for it, I promise. I had no illusions of making money when I snapped the autumn leaf in this post. Nor was I wringing my hands about about shadow noise or corner sharpness. I was simply doing what I love, in this case scrambling on creekside rocks in the forest beneath Bridalveil Fall on a crisp autumn morning. Completely alone among rocks, leaves, and gentle cascades, I knew I was surrounded by far more images than I’d ever be able to find. The emotion I feel at these times is closer to the pure joy of a childhood Easter-egg hunt than anything else I experience in my adult life, and it’s no different from the feeling I used to experience when I was out with my Olympus. I never want to lose that. 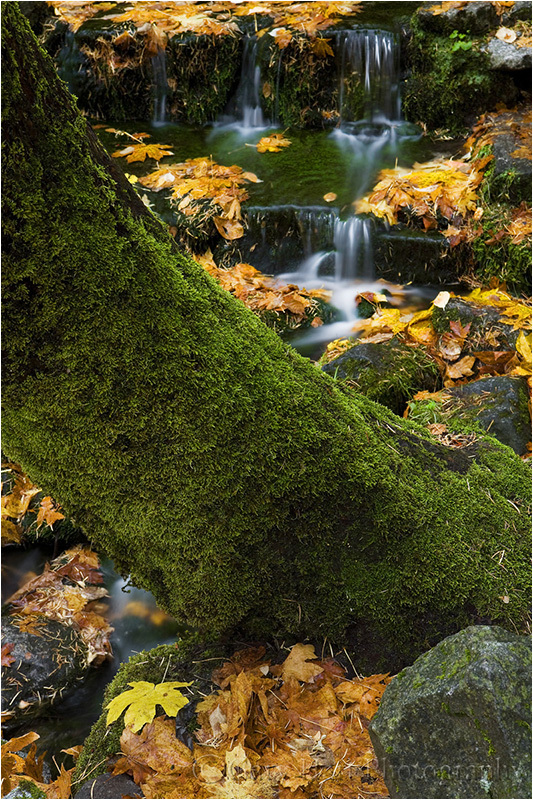 One of my favorite Yosemite autumn destinations is Fern Spring. It’s usually my first stop after entering Yosemite Valley because the leaves here give me a pretty good handle on the status of the fall color: If I can still see lots of water on the spring’s pond, I know I’m a little early; lots of brown leaves and I’m late. I haven’t actually photographed the spring itself in years; instead I cross the road and explore the half-mile stretch of trail that parallels the river, downstream to the Pohono Bridge, upstream to Bridalveil Meadow. 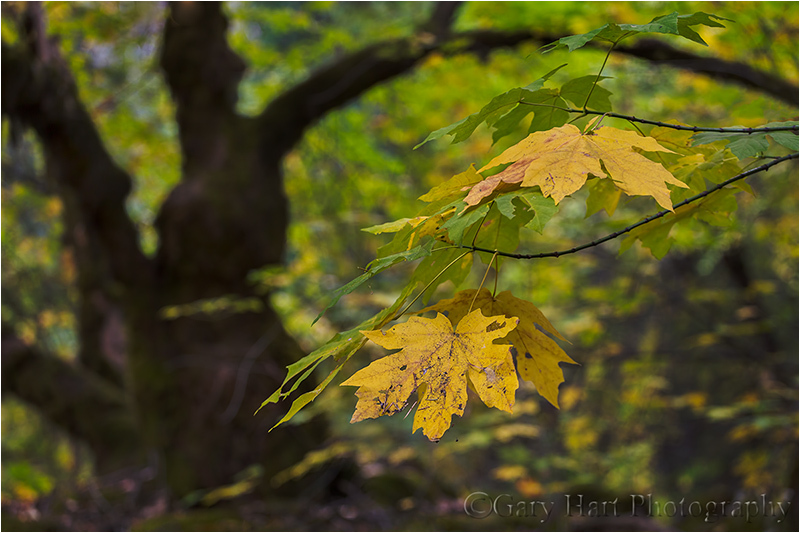 When I brought my fall workshop group here last week, we found so much to photograph that we had to come back. Some of the group stayed at the spring and crafted compositions featuring the stairstep cascade descending from the small reflecting pool. Others followed me to the river and quickly scattered in search of larger scenes. When I’m leading a group my priority isn’t my own photography, so that afternoon I stayed in the vicinity of the spring to help people with exposures and compositions. But this was fairly far into the workshop, and as is usually the case, everyone had become pretty comfortable with what they were doing—suddenly I felt pretty inessential. (Rather than pout) I set my sights on the nearby possibilities. 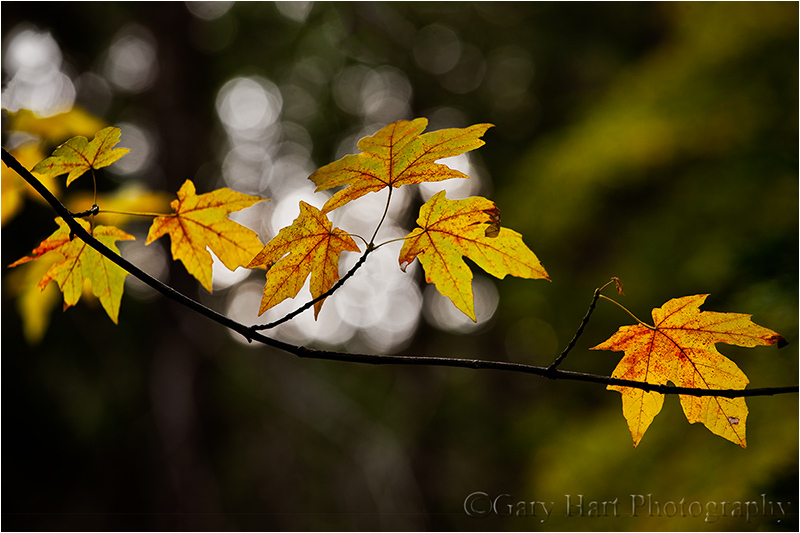 My goal is always to find something new, pretty easy when photographing small scenes featuring ephemeral leaves (in contrast to the relative permanence of Yosemite’s granite). But uniqueness is just the start: To set themselves apart, most scenes, large and small, need (among other things) photography’s often overlooked third dimension, depth. So I’m never content with simply finding a photogenic primary subject—regardless of my subject, if it’s distant I want a complementary foreground; close and I want a complementary background. I’d been to Fern Spring so much, I was pretty sure I’d pretty thoroughly mined the possibilities here. So imagine my surprise to spy a heretofore overlooked tree with a sturdy trunk and arcing branch, a wealth of untapped compositional possibilities, right across the road from Fern Spring. How could I have missed this in my hundreds of visits here? I can only imagine the number of times I’d rushed past this beautiful specimen in my haste to probe the forest’s more private depths. Shame on me. But anyway, no time for self-flagellation…. I studied the tree and its surroundings, looking for leaves to isolate. My eyes quickly landed on a solitary branch sporting several leaves in varying stages of fall transition—in a perfect world the leaves would have been backlit (for that fall color glow I so love), but that would have put me on the wrong side of the scene, and the world is rarely perfect anyway. My lens of choice in these autumn leaves scenes is a telephoto, most often my 70-200 f4 because I almost always prefer its sharpness, speed, and ease of use over the extra reach of the 100-400. So, with 70-200 in place, I circled the leaves until I thought they aligned properly with the tree in the background. Removing my camera from my tripod, I framed the scene through the viewfinder, searching for the best relationship between the yellow leaves and brooding tree. I found that by dropping to the ground I could eliminate the less interesting foreground and frame my leaves with the curved branch. And on the ground I stayed, for I don’t know how long. I tweaked the composition until I had it “just right,” then (with the composition locked in on my tripod) went to work on the exposure, depth, and focus point. Dense shade makes the area around Fern Spring dark on even the brightest day, but this was late afternoon in autumn, so the sun’s fading light had been further extinguished by Yosemite Valley’s steep walls. As if that wasn’t enough, a bright sheen on the leaves made a polarizer an absolute necessity, subtracting two more stops of precious light. And while it wasn’t windy, neither was the air perfectly still, a problem compounded by my proximity to a road teaming with rushing vehicles. Fortunately my goal was a soft background, which required a large aperture—had I needed to go to f16 I probably would have been out of luck. Nevertheless, even at f4 I had to go to ISO 800 to expose at 1/12 second, a pretty marginal shutter speed in these conditions. I used live view magnified ten times to ensure precise focus, targeting the veins on the closest leaf, and carefully timing exposures for lulls in the wind. As I usually do when I have a composition so heavily dependent on depth of field, I bracketed my f-stops, stopping down to f8 in one-stop increments, bumping my ISO even further to ensure a reasonable shutter speed. But at home on my large monitor I wasn’t crazy about the busyness in the leaves introduced as the depth of field increased, and decided f4 was best. Also on my large screen I was thrilled to see how perfectly sharp the images were (I love that lens), and how noise free they are at ISO 800 (I love my new camera). It’s one of those images that stands up to even the closest scrutiny—the more I examine it, the more I see: small holes, dirt smudges and mote, and even miniscule particles of debris suspended by a delicate spider web, the “imperfections” that underscore nature’s perfection. I have no illusions that this image will make me rich—most people are drawn to far more dramatic captures. But when I decided to photograph nature for a living, I promised myself to only photograph what I want to photograph, and never to base my choices on what will sell. I can’t even begin to express how much I enjoyed photographing this scene, and how much pleasure this image (and others like it) bring me. It’s a reminder of why I do what I do, and why success should never be measured in dollars alone. Fern Spring, Yosemite: Each spring I gauge the progress of the fall color in Yosemite Valley by the leaves around Fern Spring. 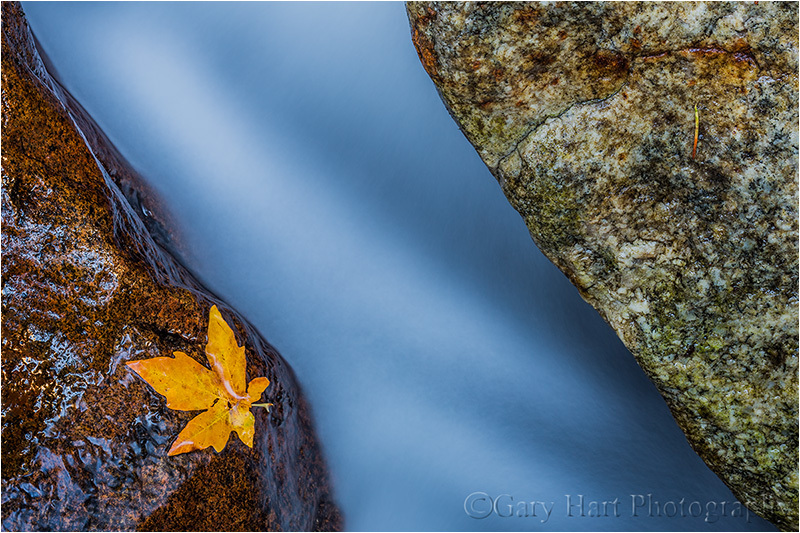 I’m frequently asked if I positioned a leaf, moved a rock, or “Photoshopped” a moon into an image. My (truthful) answer is always the same: “No.” I suspect I’m asked this so much because I aggressively search for natural elements and patterns to isolate and emphasize–they’re not hard to find if you look. We all know photographers who have no qualms about arranging their scenes to suit their personal aesthetics. The rights and wrongs of that are an ongoing debate I won’t get into. 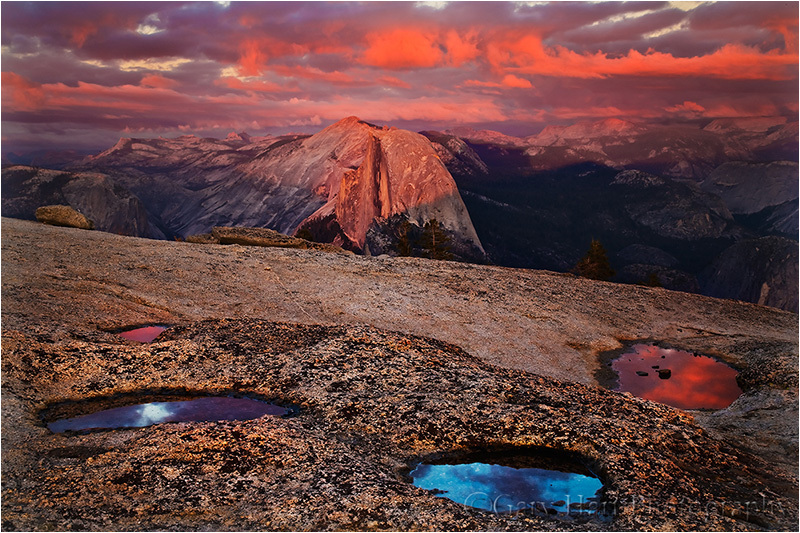 But the pleasure I get from photography derives from revealing nature, not manufacturing it. There’s enough naturally occurring beauty to keep me occupied for the rest of my life. Nature is inherently ordered–in the big picture “nature” and “order” are synonyms. But humans go to great lengths to control, contain, and manage the natural world. We have a label for our failure to control nature: chaos. Despite its negative connotation, what humans perceive as “chaos” is actually just a manifestation of the universe’s inexorable push toward natural order. Imagine all humans suddenly removed from Earth. No lawns would be mowed, buildings maintained, floods “controlled,” oil drilled, etc. Let’s say we return in 100 years–while the state of things would no doubt be perceived as chaos, the reality is that our planet would in fact be closer to its natural state. And the longer we’re away, the more human-imposed “order” would be replaced by natural order. Embracing the concept that nature is inherently ordered makes it easier to find order when you explore the world with your camera; photographic success suddenly becomes a function of your ability to convey nature’s order with your camera. Elements and relationships, lost in the confusion of 360 degree human sensory input, can snap into coherence in the rectangular confines of a photograph. What does all this have to do with a leaf on a rock? 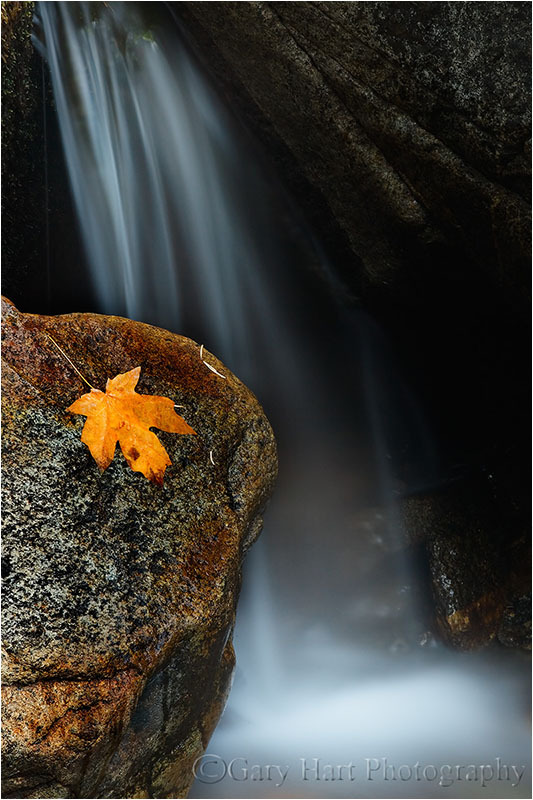 The leaf clinging to a wet rock was just one of thousands of colorful leaves decorating the cascades of Bridalveil Creek in Yosemite. By carefully positioning it within the finite boundaries of my frame, I was able to make the leaf stand out from the confusion of the competing elements surrounding me. In other words, I’m controlling your experience of this moment by giving your eyes a single element on which to focus, and capturing it against a simple background that allows you to plug in your own sensory memories. Hear the water? Feel the chill? 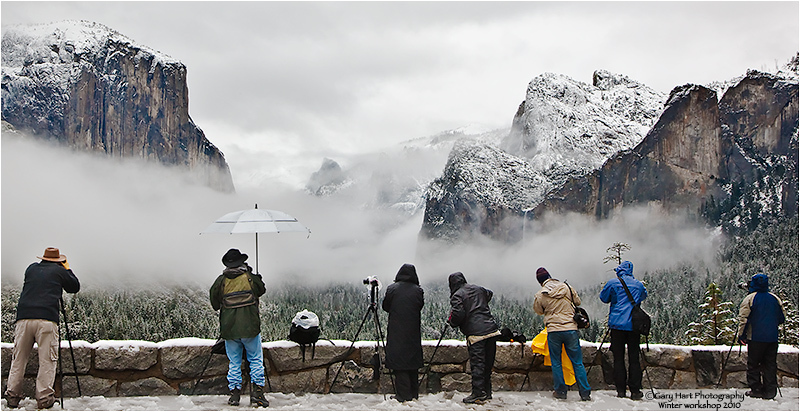 In a recent post I mentioned that I don’t photograph Yosemite’s Tunnel View much anymore. It’s not that I visit Tunnel View any less frequently, or love being there any less than I once did; it’s more the growing realization collecting images already done (by myself or others) doesn’t really excite me. The longer I do this, the more I appreciate the simple pleasure of capturing a moment in nature, of finding a small detail or ephemeral scene that’s often overlooked and will never be repeated. 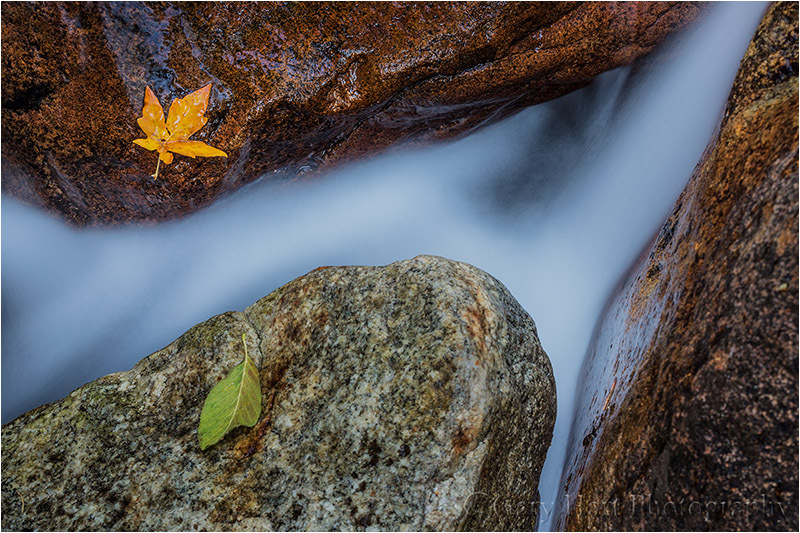 On a recent fall visit to Yosemite I meandered the bank of the Merced River near the Pohono Bridge and Fern Spring. As is often the case this time of year, a number of photographers were stationed on and near the bridge, and the usual swarm of tripods jockeyed for position around the spring. But the world was blissfully quiet among the trees. While the dogwood, usually fiery red in early November, were still mostly green, the maples flashed brilliant yellow. Even the slightest breeze sent a few leaves wafting, but closer scrutiny of those still holding tight showed many with a few molecules of spring green, a sign that the fall display wasn’t quite finished. Positioning myself beneath an overhanging branch, I zoomed my 70-200 tight, separating the branch from its surroundings to make it appear suspended in midair. Despite a gray overcast and dark evergreen canopy, a few dots of light leaked through overhead. Usually I’ll compose bright sky out of a frame like this, but here I decided to feature it, dialing in a large aperture (f5.6) to soften the individual pinpoints into overlapping jewels. Because a narrow depth of field makes the focus point particularly critical, I switched to live-view and magnified my LCD to ensure precise focus. The narrow depth of field also smoothed the background trees, erasing distractions and setting the sharp foreground leaves against a complementary canvas of color, shape, and light. These leaves are brown now, decomposing on the forest floor, or perhaps far downriver. While there’s no doubt in my mind that as I clicked this frame many simultaneous clicks captured whatever was going on at Tunnel View, I’m pretty sure I’m the only person in the world with this image. That’s a nice thought for sure, until I remember that within a few feet of where I stood were an infinite number of other unrepeatable images that I missed. Guess I’ll just have to keep trying….